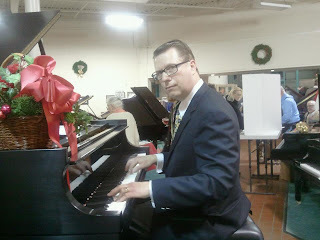 Howard played the piano at the holiday shopping evening at Denton, Cottier and Daniels. It was "An Artful and Elegant Evening of Shopping." And Howard was artful and elegant! There he is up above. I had to go tell him to take his foot off the soft pedal because he was good and the world should hear him. What if Leonard Pennario had kept his foot on the soft pedal? No one would have heard him. The evening at Denton's was fun. I bought two scarves from the Amherst Symphony and wore one to work today. It is fun and comforting to have a scarf to wrap around you while you are at work. This always happens to me, I go places thinking I will buy presents for other people. And I wind up buying them for myself!